Last month, I went down to my favorite city in America (and hopefully, my final destination! ), Greenville, SC for a couple of days. I was able to meet up with my wonderful friends Cindy, Alan, and Kesley for dinner on the patio of Hans and Franz Biergarten – just up the road from my hotel. It’s really unfortunate that their menu is not online, because you have to see it to appreciate just how expansive (and overwhelming!) it is. We quickly decided to share some Kraut Balls and Obastzda (cheesy deliciousness). When it came to dinner though, I was not able to make a decision. So, in true form, I turned the decision over to our waitress, Rhonda, and she brought me a plate of Rouladen. Bacon, pickles, onions, mustard surrounded by beef - how can you go wrong?!? 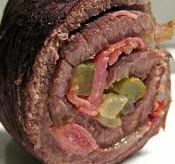 As you can see, the dish consists of bacon, onions, mustard and pickles wrapped in thinly sliced beef and cooked up to perfection. It really was a delicious meal. I commend Rhonda on choosing a traditional German dish, and not necessarily playing it safe. This is why I love playing the “She Ordered What?! ?” game! how did i miss this one! OMG! Bacon and beef and GRAVY. #noms! I knew you’d appreciate that one! Next time you’re in G’ville, make Cindy meet you there!